The Global Payroll Management Institute (GPMI), in collaboration with the Irish Revenue Commissioners and Payslip, recently held a webinar covering PAYE Modernisation. The radical changes to Ireland’s Pay As You Earn (PAYE) tax system, since its introduction on October 6th 1960. The Global Payroll Management Institute (GPMI), in collaboration with the Irish Revenue Commissioners and Payslip, recently held a webinar covering the radical changes to the Pay As You Earn (PAYE) tax system in Ireland. 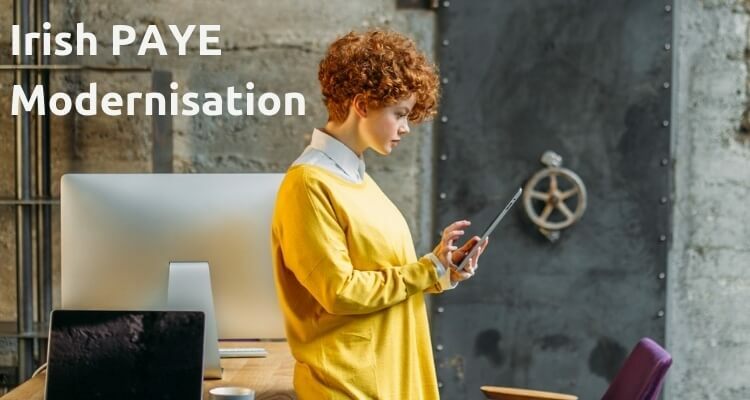 The webinar was attended by over 320 employers from large multinational companies across the US, Canada, Ireland, UK and the Netherlands who were eager to learn more about the PAYE Modernisation changes which come into effect in Ireland on January 1st 2019. 39% were unaware that critical forms to PAYE as we know it will be abolished by January 2019. With this in mind, we have put together information covering our key learnings on PAYE Modernisation to help you along the journey to becoming compliant. Pay As You Earn (PAYE) Modernisation is the most significant reform of the PAYE System since its introduction in the 1960s. The aim of the change is to improve streamlining of companies current business processes and to reduce the administrative burden experienced by employers in a bid to meet their PAYE reporting obligations. From January 2019, employers will be able to utilise real-time reporting on Revenues’ Online Service Platform to calculate and report their employees’ pay and deductions as they are being paid. This will make it easier to deduct and pay employees at the right time and in the correct amount. We spoke to Anne Reilly, Founder and CEO of Paycheck Plus on PAYE Modernisation and how Irish employers feel about the radical new changes coming into effect in January 2019. At Paycheck Plus, we provide payroll outsourced services to Irish employers across all verticals – financial services, technology, large retail. The PAYE modernisation programme is the single largest set of changes to Irish payroll in years. It brings with it specific compliance and filing obligations for the employer. Our clients are actively engaging with us to understand the additional requirements and have a plan of work to ensure compliance from Jan 2019. At the same time, we see many Irish employers who always maintained their payroll internally, are now seeking external support from us, as they see that we are professional specialists in this area and have (a) the systems in place and (b) the structures with the Revenue Commissioners of Ireland to enable their compliance. So the PAYE Modernisation has caused some concern, however the employers are investing time to be ready. Any employers who have not yet engaged with this topic – we would urge them to start soon as there are only a few months left and the penalties and fines for non-compliance can be avoided. What are the current PAYE Obligations? Currently, employers apply the latest P2C (Tax Credit Certificate) to their employees’ gross pay and deduct Income Tax, PRSI, USC and LPT. The employer then provides the employee with a payslip showing gross pay, the deductions made and net pay. At the end of each month or quarter, the employer must submit a P30 return of PAYE, USC, PRSI and LPT to the Revenue Commissioners. By February the following year employers must complete a P35 with the associated listing for all current employees to the Revenue Commissioners. Employers must ensure they have a copy of the P45 for employees leaving the company and a P46 for employees starting work at the company. What changes will be implemented with PAYE Modernisation? PAYE Modernisation ensures a seamless integration of reporting into the payroll process. It will minimise the cost of compliance to employers and time spent on keeping PAYE information for employees accurate and up to date. P60 – An end of year record of an employees’ earnings and any deductions paid by the employee including income tax, PRSI and USC. In addition, the current Tax credit Certificate (P2C) will be replaced by Revenue Payroll Notification (RPN). The RPN will provide the employer with up to date and correct deduction amounts for Income Tax, USC and LPT for each employee. It will also show the employees tax credits, any previous pay, tax and USC deducted from 1st January 2019 and any income tax or USC exemptions. Will current payroll software comply with PAYE Modernisation? Revenue have been working with payroll software providers leading up to the implementation of PAYE Modernisation to ensure the payroll software available on the market will allow employers to meet the reporting requirements in January 2019. If a reporting package is not being used in the business, Revenue have developed the Revenue Online Service (ROS) platform to help companies meet the reporting requirements. How can employees prepare for PAYE Modernisation? Ensure you have the right Personal Public Service Number (PPSN) for each employee. Where can I find more information on PAYE Modernisation? Revenue, Irish Tax and Customs have an abundance of information on PAYE Modernisation and how to ensure your compliance by 1st January 2019. Visit www.revenue.ie for more information. Payslips’ Irish Payroll Provider Network are at hand to help you in your efforts to implement PAYE Modernisation before the 1st of January 2019.